He’s done it again. 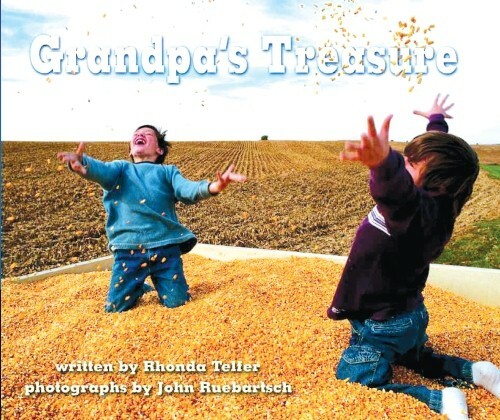 Photographer John Ruebartsch helped create another children’s picture book, Grandpa’s Treasure, this one about farms. Ruebartsch worked with writer Rhonda Telfer on the project. Far from an ordinary book about farming, this gem has special messages for city kids. The first is that farms are fun! Softly woven into the harvest time story and color photos, yet clear to young and old alike, is the message that urban sprawl is shrinking our farmlands. The book’s main characters, Aaron and Will, look to be around ten years old, and they live next door to each other in an Illinois suburban neighborhood. Both boys love to play knights, castles, and dragons. One day Aaron says to Will, “Come to my Grandpa’s farm. He has his own castle.” Never having been to a farm, Will brings some of his toys along “in case there was nothing to do.” He soon discovers just how fun a farm can be. The barn doors rumble open like huge gates, and the barn becomes a castle. The boys climb wooden steps to the hayloft, their “lookout tower.” The hay chute leads to a dark dungeon below, and outside their tower window a big, green combine dragon “growling and heading toward the barn” prompts the young knights to defend their castle with invisible arrows. Later out in the fields and armed with dried corn stalk spears, they stage an attack on an old silo, “the enemy tower.” Telfer and her brother, graphic artist Rod Gingrich who designed the hardcover’s jacket, both grew up on their family farm in the same area of Illinois as Grandpa’s farm. “We had a huge pool of people to draw from [for photos],” says Ruebartsch. “The whole community really got into it, and that’s the beauty of this book.” Telfer’s in-laws own the book’s farm, built in 1858. Their neighbor Mr. Mott was chosen for Aaron’s Grandpa. Telfer’s father is still a farmer, and was also “really into the book. He helped us do location scouting,” says Ruebartsch. “We’d drive around in his pick-up truck scouting out possible views and locations.” Ruebartsch’s interest in photography began early. “I did a little bit in school, and then I caught this bug.” He started to show his work in places like the Riverwest Art Walk, then in galleries, all the while accepting photography jobs – portraits, CD covers, calendars. He likes to address sensitive social and cultural issues through his work. In 2001 Ruebartsch and clinical psychologist/writer Kenneth Cole created the children’s picture book, No Bad News. Photographed on the streets of Riverwest, it tells the story of Marcus, a young boy on his first solo walk to the barbershop. He learns that holding his head up and looking for the good news (instead of the bad) can dramatically change his mood. Ruebartsch and Cole also collaborated on Friends and Neighbors, published through Creative Sharp, a local organization working with art and literacy in schools. Ruebartsch’s other children’s books include All Around Milwaukee, A Kid’s Tour Guide to the City, and just out, All Around Wisconsin, published by Sharp Literacy Inc. (formerly Creative Sharp). Ruebartsch and Telfer plan a sequel to Grandpa’s Treasure. The story takes place in the same farming area, but during planting season. This time two girls visit Grandpa, and they talk about things like big plants coming from little seeds. You’ll find Ruebartsch’s books at Woodland Pattern, all Schwartz Bookshops, Riverwest Co-op, and Barnes & Noble. Order online at www.visualgeneration.com. Holidays are coming, so think about these special books for kids on your list. Also consider gift portraits of yourself for you and your family, all created by homegrown talent.